One of the most annoying experiences while browsing the web is URL redirection. Have is ever happened to you? You click on a link or enter a website address expecting to land where you expected. But end up somewhere else. Your target URL has essentially been hijacked, landing your browser somewhere else. My most recent issue was getting redirected to smartDNS proxy. No matter how many times I tried, many of my intended URL locations ended up there. An uninvited and unwanted intrusion. smartDNS proxy wanted you to sign up for their service to resolve the problem…for a fee of course. Extortion is the proper term for it. And searching for a solution using google only results in long winded step-by-step instructions for getting rid of smartDNS proxy. Only problem was, in my case, it did not solve the problem. it appears to be a tactic to wear you down, so you will buy the quick solution, “SpyHunter”. That also looks like a suspicious product to me. Here is what I found to work for me. It is free. No charge! and only required a few steps. I hope this information may provide some relief for anyone encountering a similar problem. 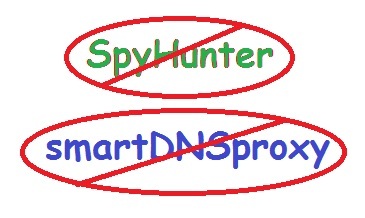 The origin of the problem clicked to me as I observed that all of my home network devices exhibited the same undesirable redirection to smartDNS proxy. That included my smartphone. Yet when I used my 4G to browse instead of the network WIFI. the problem went away. And that ruled out “SpyHunter” as a viable solution as it is supposed to clean a single “infected” device. The problem was not with the web browser, but rather originated in the router. That is the single common component that all network connected devices share. The router resolution of website domain names to IP addresses is accomplished through the DNS Servers that it is configured to use. Every router has a unique way to access these settings. You will need to consult your router documentation to determine how to access your router’s DNS server settings. When I looked up my router DNS servers, they were set to “23.21.43.50” (primary DNS server) and “54.229.171.243” (secondary DNS server). Using the “whois” utility at https://www.ultratools.com/tools/ipWhoisLookup, I was surprised to note that both DNS servers were owned by Amazon Web Services. And it was not clear as to how those servers had been set in my router. Still, while it did not seem likely that the trusted Amazon name was being hijacked by smartdns proxy, the only way to find out was to change the DNS servers. And sure enough, changing the DNS servers completely got rid of my smartdns proxy redirection. Without the need for “SpyHunter”. My router is now configured to use the google DNS Servers. And all is good! I hope this information is useful to many web users that have had a similar problem.